Pumpkin Roll is synonymous with Thanksgiving in my family, and I hope soon – in yours. 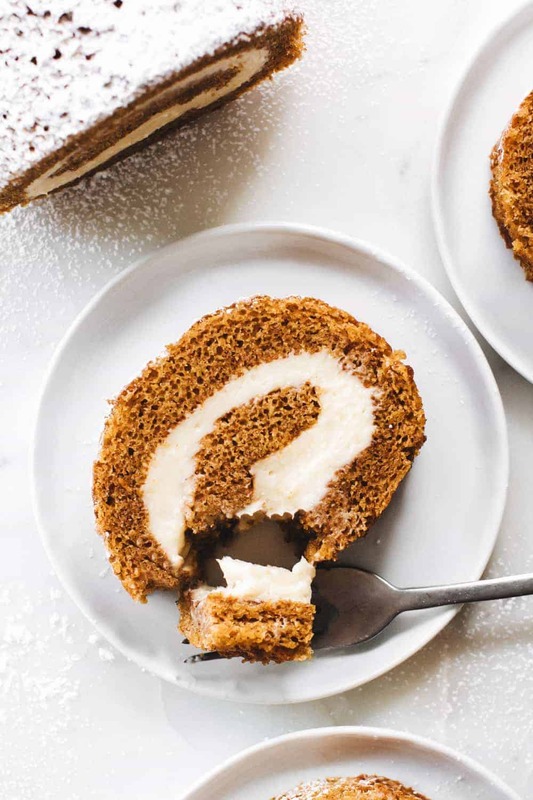 This Pumpkin Roll recipe is easier than you think, and will make you a holiday dessert superstar. Read on to find out how to roll a pumpkin roll and how to store one in the freezer! My Nana was an amazing baker and was always up for involving me in her kitchen. She’d perch me atop a bar stool and side by side, I’d take in her talent and mimic her techniques the best that I could. Despite my young age she undoubtedly had a tremendous amount of confidence in me. She never questioned my ability to use a knife or remove baked goods from a piping hot oven. I was her sous chef and during our bake-a-thons, I was treated like an adult – not a 7-year-old kid with a permed mullet and retainer. There is no question that I inherited my whirlwind styling of baking from her. We would tear up her kitchen and dig our way out hours later. But she also instilled a fearlessness with food that I will forever be grateful for. How many second graders do you know that can whip out a perfect pumpkin roll with little to no guidance? As far back as I can remember, Thanksgiving was pretty much synonymous with Pumpkin Rolls. We would set aside a weekend and systematically crank out about 30 Pumpkin Rolls that Nana would give away as holiday gifts to friends, family and fellow church members. To this day, those Pumpkin Roll filled days are some of my fondest childhood memories. Nana often baked and cooked from memory, so I don’t have her exact Pumpkin Roll recipe. But I do remember her “doctoring up” the Libby’s recipe with secret ingredients, which I am pretty certain was pumpkin pie spice, so that’s pretty much what I’ve done for years with delicious results. 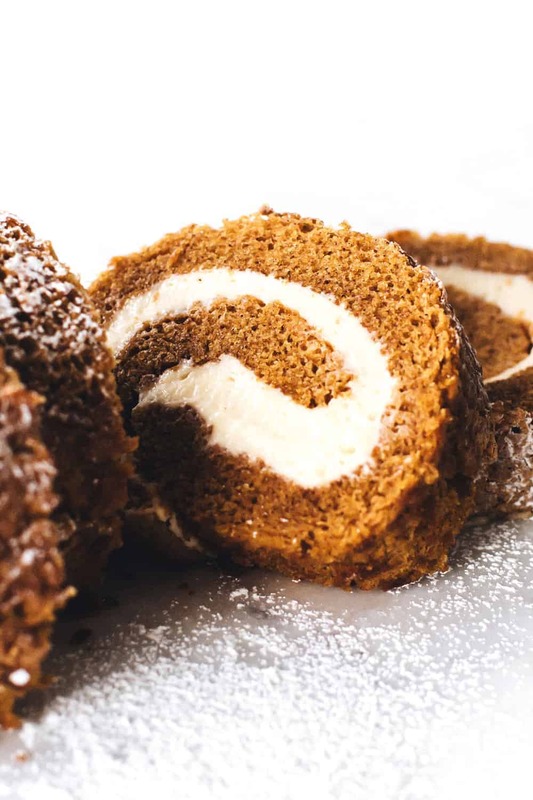 The beautiful swirl in a Pumpkin Roll might make it look hard, but this Pumpkin Roll recipe is actually quite easy! You need just a handful of standard cake and cream cheese frosting ingredients as your Pumpkin Roll ingredients. The most important thing is to get the right kind of pumpkin. Make sure you get a can of pure pumpkin puree. The ingredient list should simply say “pumpkin.” My favorite brand is Libby’s. 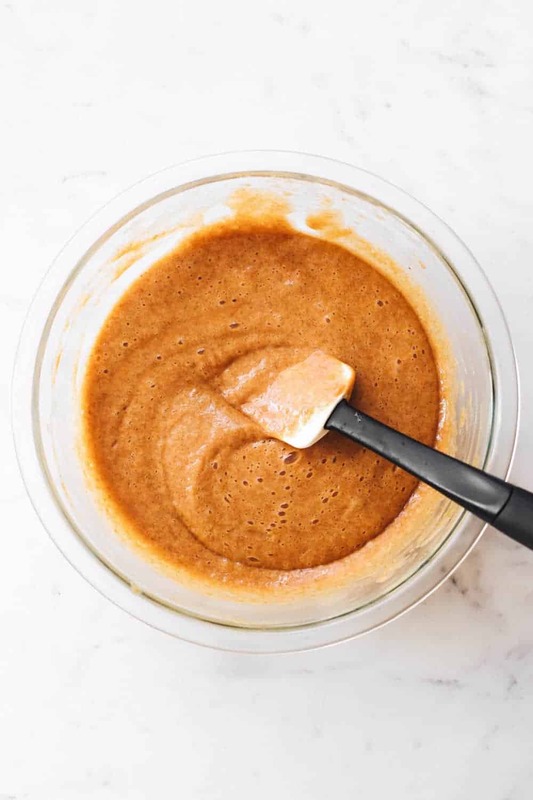 Do not get pumpkin pie filling – it has added salt, spices and other ingredients that we don’t want in our Pumpkin Roll recipe. 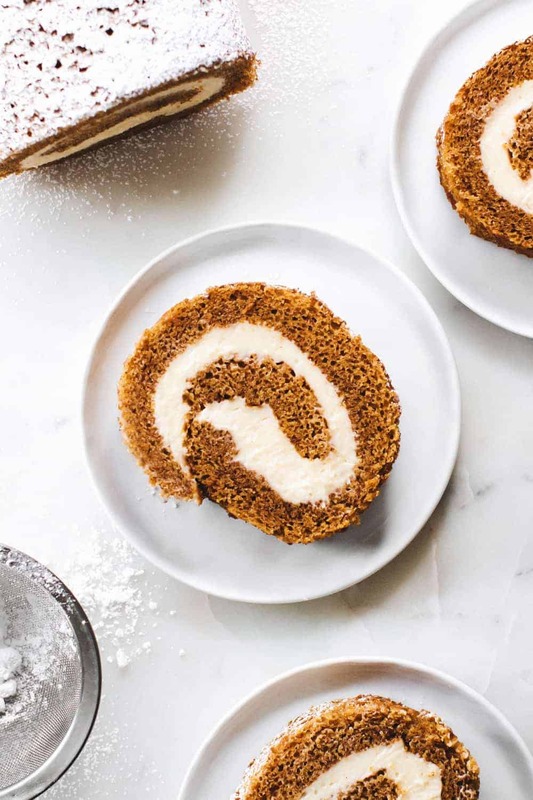 Getting that perfect Pumpkin Roll swirl isn’t as hard as it looks, either! I promise. 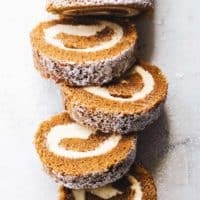 Unlike recipes like Caramel Apple Cinnamon Rolls that are rolled and filled before being baked, Pumpkin Rolls are rolled up after they come out of the oven. The trick is to remove the cake from the pan as soon as it comes out of the oven. Turn it out (carefully) onto a clean tea towel that you’ve dusted with powdered sugar. Now you can roll up the cake and the towel together – make sure to start from the short end and not the long end! 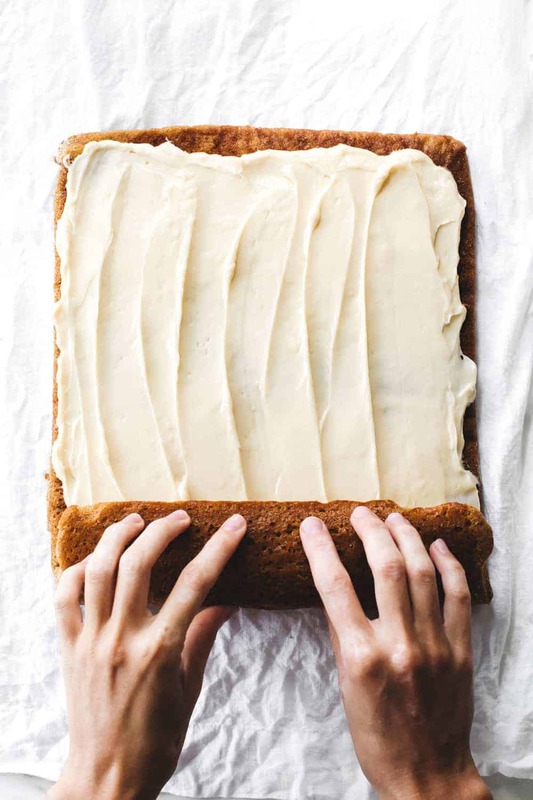 Place the cake – stilled rolled in the towel – on a cooling rack and let it cool completely. After it cools, you can unwrap it from the towel and add the cream cheese filling. CAN YOU FREEZE PUMPKIN ROLLS? My Nana and I would make 30 pumpkin rolls at a time, so I’m sure you’re wondering how we stored them. 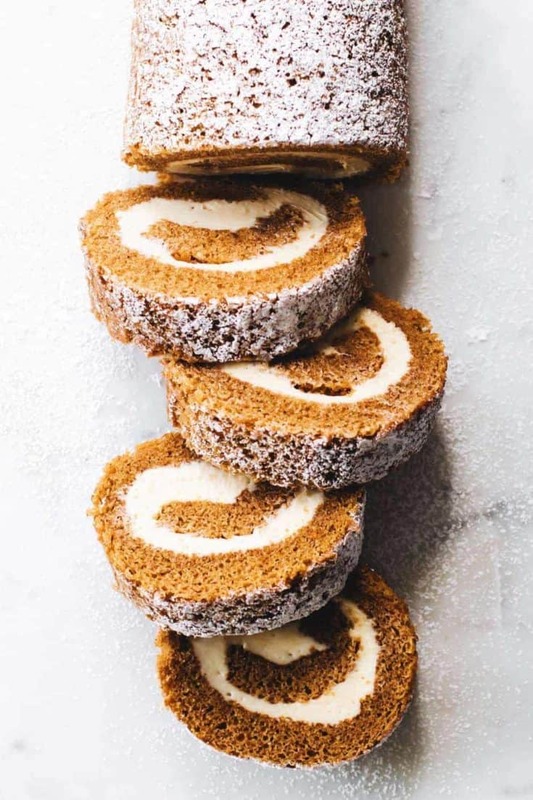 Pumpkin Rolls make a great hostess gift or make-ahead Thanksgiving dessert because they freeze so well. Prepared Pumpkin Rolls can be stored, covered, in the refrigerator for up to 5 days. To freeze, wrap the Pumpkin Roll tightly first in a layer of plastic wrap and then in a layer of foil. Store it in the freezer for up to 1 month. When you’re ready to serve, remove the frozen Pumpkin Roll to room temperature 1 hour before serving. For more tips and tricks, check out some FAQs on How to Make a Pumpkin Roll. You might have noticed that my Pumpkin Roll recipe uses only ⅔ cup of canned pumpkin puree, but a typical can of pure pumpkin contains almost 2 cups. Pumpkin Roll is synonymous with Thanksgiving in my family, and I hope soon – in yours. 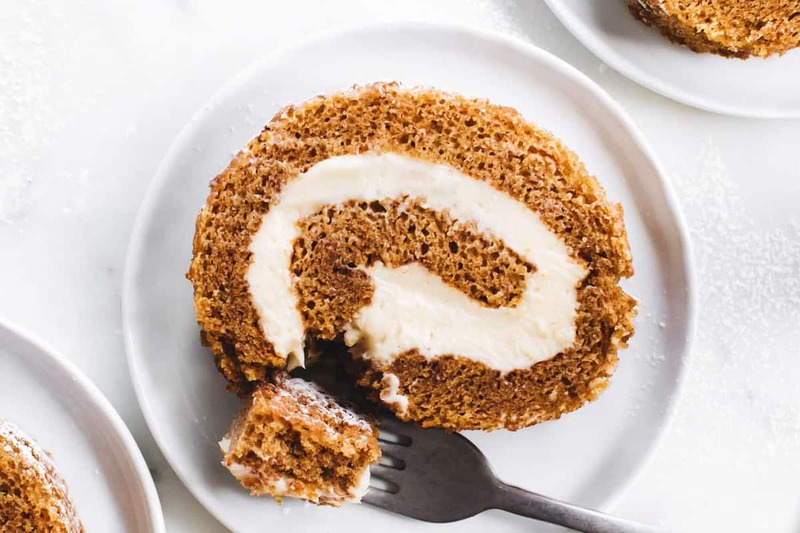 This Pumpkin Roll recipe is easier than you think, and will make you a holiday dessert superstar. Preheat oven to 375°F. Line a 15 x 10-inch jelly-roll pan with parchment paper and spray with non-stick cooking spray. Sprinkle a clean tea towel with powdered sugar. Set pan and towel aside. 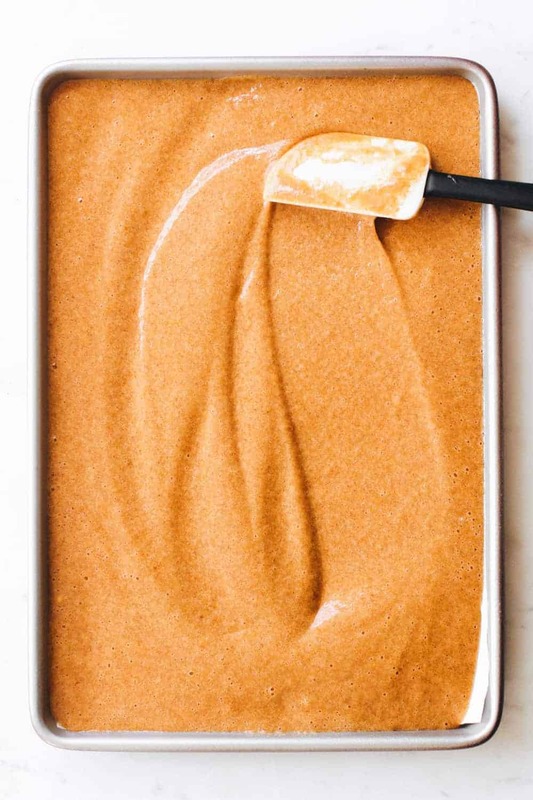 In a medium bowl, combine flour, baking powder, baking soda, pumpkin pie spice and salt. In a large bowl with an electric mixer, beat eggs, vanilla and sugar until thick. Add in pumpkin and mix to combine. Bake for 13 to 15 minutes or until top of cake springs back when touched. Immediately loosen and turn cake onto prepared towel. Carefully peel off paper. Roll up cake and towel together, starting with narrow end. Cool on wire rack. In a medium bowl, beat cream cheese, powdered sugar, butter and vanilla extract until smooth. Carefully unroll cake; remove towel. Spread cream cheese mixture over cake. Reroll cake. 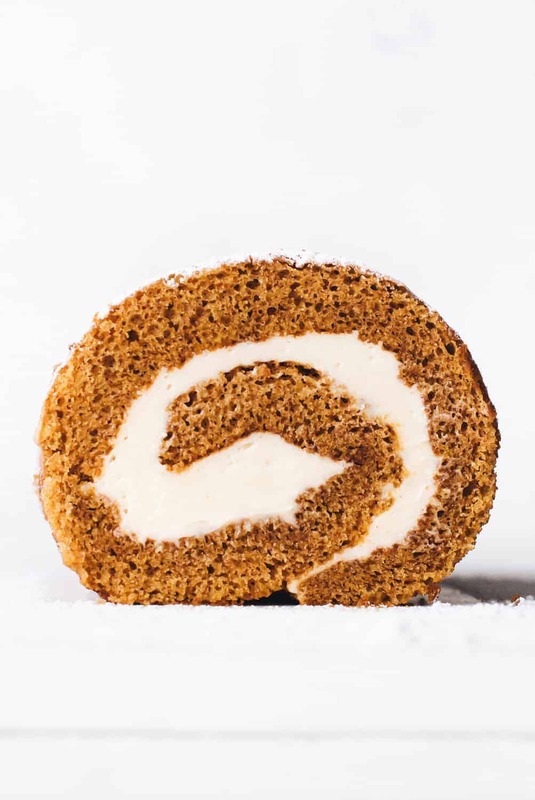 Store prepared Pumpkin Roll in refrigerator for up to 5 days. You can also wrap tightly in a layer of plastic wrap and then foil and store in freezer for up to one month. Remove frozen Pumpkin Roll to room temperature one hour before serving.